Adapted from the article, Texas schools try to get a grip on discipline problems with social-emotional lessons. More and more schools throughout the United States and Texas in particular are introducing Social and Emotional Learning into their lesson plans. These classes essentially centre on how to manage emotions and develop skills; including empathy, responsibility and problem solving. An assistant principal at one of the key elementary schools used to be one of those teachers who had little or no time for kids squirming in their chairs and ‘other annoyances’. She thought that surely by fourth grade, her students would know how to raise their hand, sit quietly and walk in a straight line down the hallways. “But they don’t”, she said. One teacher at Ridgeview Elementary School, Amanda Self, has a goal to build empathy within her classroom. Instead of just imparting empty self-esteem talk or praising poor grades for students who remain upbeat, Self’s approach focuses on teaching students to give each other “authentic compliments”. An authentic compliment could be something like, “I liked the way you helped me solve a math problem” or “I appreciated the way you were a good friend and let Suzy come and play with us”. Whereas an authentic compliment is NOT, “I like your shoes and the way your wear your hair”. Self asks the students to sit in a circle and each student takes a turn to either give praise or ask for it. On these days, more than half of her students in the class gush with admiration for their classmates. The principal at Caprock Elementary school was not faced with a frightening campus culture or violent students but needed to “get a handle on behaviours that were taking away from teaching and learning”. This included clowning around in class, excessive talking and rudeness. The social and emotional lessons were implemented campus wide, with lots of discussion among staff. Together, the staff selected two virtues to reinforce with students day-in and day-out, these were respect and responsibility. Consequently, Caprock’s hallways, bathrooms, cafeteria and playground are lined with posters that remind students to show respect, as this can be shown slightly differently through different settings. In addition, the teachers have used individual approaches for managing difficult behaviours in their classroom. For example in a grade four classroom, one child had ‘ants in her pants’. She couldn’t sit still for long at all, so each time the child would put her bottom on a chair, the teacher was there with a “Gator buck”, which the child could use to purchase a gift from the treasure box at school. This helped to reinforce ‘good behaviours’ in the classroom and create lasting changes. Moreover, another student would erupt in loud laughter in class as well as get up and dance or tell jokes. The boy stopped this behaviour when his teacher agreed to allow him to be a comedian in front of the class for 10 minutes, twice a week. Ultimately, this 10 minutes was less time than the amount of time the teacher spent trying to correct him and getting the rest of the class back on track. Our philosophy is that if we can focus more on the positive, we can decrease the negative and we’re seeing that happen. We’re seeing kids really want to work for that positive behaviour. An Analysis of the Australian Early Development Census: How Does Queensland Compare? Since 2009, the Australian Early Development Census (AEDC) has measured the development of children in their first year of full-time school across five areas: physical health and wellbeing, social competence, emotional maturity, language and cognitive skills, and communication skills and general knowledge. This is because children with a positive early childhood experience are more likely to achieve a higher educational attainment as well as demonstrate high self-esteem and social development, and fewer social and health problems. This data is gathered every three years, therefore, the aim is to inform the development of policies and programs to improve early development and help evaluate long-term strategies. Throughout both 2009 and 2012, a smaller percentage of Queensland children were found to be ‘developmentally on track’ as compared to the Australian average. These figures spanned all five domains however the largest divergence appears to be occurring in the ‘physical health and wellbeing’, the ‘social competence’ and the ‘emotional maturity’ domains. There was a massive increase in the percentage of children ‘on track’ in the language and school-based cognitive skills domain (from 60.9% to 78.5%). While this is an impressive and worthwhile improvement, this may indicate a lack of importance placed on the other four domains. Moreover, the evidence has indicated that positive improvements in these other domains, particularly that of social and emotional competence and maturity, can create broader positive changes which typically result in academic success. The developmentally ‘vulnerable’ children are those who score below the 10th percentile in the national population. Hence these children demonstrate a much lower than average ability in the various domains and require additional support. Australia wide, the largest improvements occurred through the language and cognitive skills domain with 4.1% less children developmentally vulnerable. Queensland’s improvements are in line with this, yet appear to be even greater with an improvement of 6.5% from 2009 to 2012. Therefore Queensland’s improvement has surpassed that of the national average, although it appears that this has left areas of physical health, social competence and communication skills with either no improvement or an even greater percentage of vulnerable children. Therefore, these figures may suggest that educators are placing a disproportionately high focus on literacy and classroom-based cognitive skills and neglecting the importance of the other domains. Moreover, when directly comparing New South Wales indicators, it can be seen that there were small yet dispersed improvements across all indicators. Perhaps Queensland policy makers and educators need to follow suit and place a broader focus on all domains, especially that of the social competence and communication skill based competencies. This argument is also reinforced by the concern that Queensland is lagging behind the Australian averages in all domains. 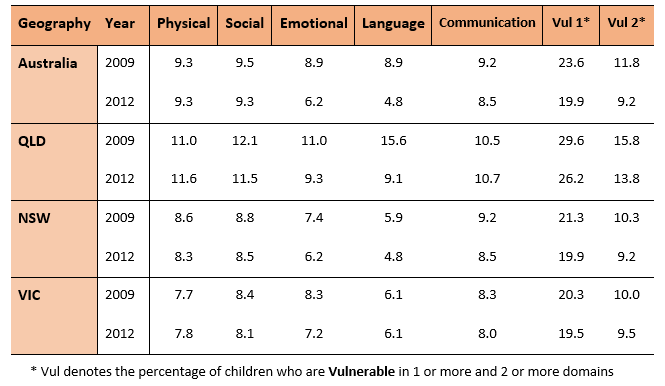 Moreover, there are a greater percentage of children vulnerable in 1 or more and 2 or more of the five domains. Therefore, although these indicators have improved within Queensland from 2009 to 2012, our state is falling behind the majority of Australia. In summary, these figures indicate some promise, as Queensland has improved the prospects for our young children from 2009 to 2012. However, it is very apparent that significant improvements need to be made across all five domains in order for broader, perhaps more enduring changes to be realised. Moreover, Queensland is lagging behind both the national average as well as those of New South Wales and Victoria, therefore this provides striking evidence for educators and policy makers to implement targeted changes throughout the state. As mentioned, the purpose of this research is to help promote positive development and outcomes in young children, therefore these results should not be undervalued. Nevertheless, as the 2015 AEDC data is released in the future, we will be able to further understand which areas are improving and which areas require more targeted education and resources. This article is based on the 7:30pm report by Louise Milligan, 1 Sep 2015. Broadmeadows Primary School is located in Melbourne’s lowest 12th percentile for socio-economic disadvantage. However the school’s principal, Keith McDougal, stated that their postcode does not determine the child’s destiny as “where you start doesn’t matter – it’s where you end up that counts”. Therefore, this school has implemented revolutionary approaches based on neuroscience with the aim of improving the children’s learning potential and boosting grades. All of the students wear a “learning goal badge” every day. These goals are based on interviews with students, parents and teachers and are based on each student’s individual needs. Some students focus on academic goals like improving handwriting where other goals are more fundamental, such as getting more sleep at night, eating properly or improving anger management. This school looks at “behaviour as a learning experience”. From this, the number of students removed from the classroom and playground due to aggressive behaviour has decreased enormously. Moreover, before lessons in the morning, the students visit the “emotion wall”. Through this, they post their photo on a noticeboard next to an image of the emotion that they are feeling. This helps teachers keep track of any children who might be struggling and need extra attention and help. So if they see a child move from a happy to a negative emotion, they can implement a one-to-one follow-up. Through all of this, the children appear to be showing better emotional and behaviour regulation and seem happier in general. Moreover, the school’s NAPLAN results are higher than any other school in the area and their year three results are above the Victoria state average. Therefore, this school teaches an important lesson to all educators and parents; as learning occurs at its best when children are feeling confident, safe and happy.